Samsung has announced the second generation of its smart fridges at the ongoing CES fair. Family Hub 2.0 allows effortless communication and interaction between user and fridge. For example, a user can talk to the fridge using voice recognition, add user lists and even enjoy music organised by Spotify. 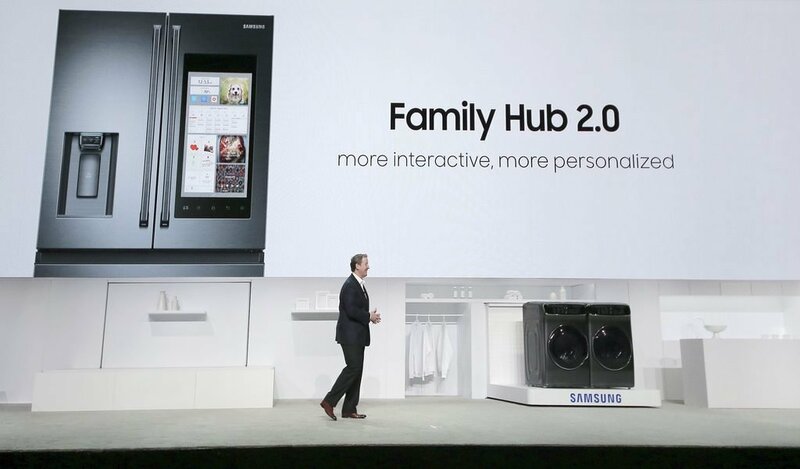 Samsung launched Family Hub at CES in 2016. The second generation contains several enhancements that will attract more consumers to switch to a smart fridge. More and more fridges in Samsung’s refrigerator line-up will feature a 21.5-inch LED touch screen located on the outside of the right door. The touchscreen is at the heart of Family Hub 2.0. Samsung has focused on improving the functionality and features of the apps in Family Hub’s ecosystem. Family members can set-up different profiles with an associated avatar. The Family app on a mobile device like a smartphone or tablet enables direct communication with the fridge’s LED display. For example, a teenage son could easily send an image of his preferred meal of the week to the fridge. Spotify has been integrated into Samsung Family Hub 2.0. The fridge contains loudspeakers and the Spotify integration creates a mini-audio system in the kitchen. Another cool third-party application is grocery shopping. Samsung has partnered with the German discount chain Lidl in Europe. This partnership allows a user to seamlessly order missing items that the fridge has detected in just a few clicks. Samsung Family Hub 2.0 fridges employ three built-in cameras that record item in the fridge by taking a photo everytime the fridge door closes. These photos can be accessed from any location using the View Inside app. Hence, no more guessing of what to buy when you’re out shopping. Just open the app and peek inside your own fridge.